As some of you have already noticed, file uploads from the photo library in iOS 8 are broken. The only current solution is for the end-user to use the Chrome browser. We have put up a small banner for Safari on iOS 8 devices to notify them, and use chrome. This will be removed as soon as it is fixed. 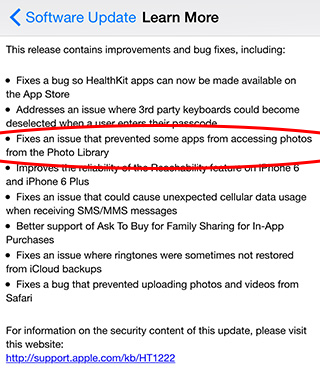 There have been many reports of this issue on the web, and with the release of iOS 8.0.1 it was announced as fixed. Don’t get too excited though! As we were writing this, Apple pulled the release as it caused more problems with loss of service and TouchID issues. Hopefully it’s an easy fix, and everything will return to normal quickly. Apple released iOS 8.0.2 last night and we can confirm that it fixes the issue. Uploads from the Photo Library are working again.